SACRAMENTO, Cailf. 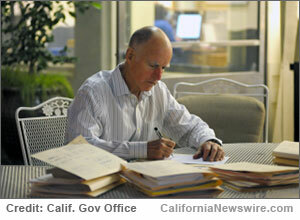 /California Newswire/ — Taking action to boost financial security for all Californians, Calif. Governor Edmund G. Brown Jr. today signed SB 1234 by Senate President pro Tempore Kevin de León (D-Los Angeles), that will create new retirement savings accounts for the nearly seven million workers who do not have one. Under the new law, workers who do not have a workplace retirement plan will automatically contribute 3 percent of wages to a new retirement account, the California Secure Choice Retirement Savings Trust. This fund will invest in a diversified portfolio that focuses on long-term financial growth. Workers can change their contribution levels at any time, or choose not to participate. The legislation prohibits the state or employers from incurring any liabilities associated with the new program. In 2012, Governor Brown also signed legislation by Senator De León, which created the California Secure Choice Retirement Savings Investment Board, a state board to study the feasibility of implementing the new retirement plan enacted today. Researchers have estimated that California’s senior population will increase 64 percent, to 12 million, by 2035. Nearly 50 percent of middle-income workers are at risk of entering poverty when they retire, and Social Security payments alone, which average $1,341 per month, are not sufficient to support them. Today’s legislation provides a reliable and affordable retirement savings opportunity for the Californians who do not have a workplace retirement plan. SB 1234 builds on the Governor’s continued efforts to help reduce poverty in California, which have included establishing the state’s first Earned Income Tax Credit, signing landmark legislation to raise the minimum wage to $15 per hour statewide, enacting the most aggressive equal pay legislation in the country and funding the first cost-of-living increases for Supplemental Security Income/State Supplementary Payment since 2005. The Governor has also enacted sweeping, bipartisan pension reform legislation that saves billions of taxpayer dollars, taken action to reduce California’s long-term fiscal liabilities by fully funding, over a period of years, the teachers’ retirement system and established trust funds to gradually eliminate the unfunded liability for retiree health care through prefunding. When Governor Brown took office in 2011, the state faced a massive $26.6 billion budget deficit and estimated annual shortfalls of roughly $20 billion. Since then, the state has eliminated these deficits with billions of dollars in cuts, an improving economy and new temporary revenue approved by California voters. This year’s budget also directs an extra $2 billion into the state’s Rainy Day Fund, in addition to the constitutionally-required $1.3 billion deposit, bringing the fund balance to $6.7 billion, or 54 percent of the goal.